In Korea, the meeting space rental industy near Colleges and office districts has been growing fast. Students want to gather and study together while office workers want to develop themselves through seminars and lectures after works. However, there weren’t enough informal meeting spaces near universities and office areas. Unlike US, in Korea 3-4 colleges are clustered near one subway station, and office buildings are located near subway stations as well. Due to the geographical factor, there has been growing demands for meeting spaces. 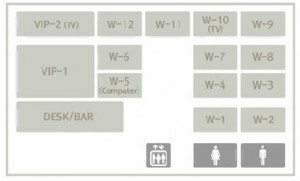 Some cafes in Korea have meeting space in separate rooms, but it can only accommodate one or two group. The biggest success factor of meeting space rental business is in private space for various party sizes. I chose a successful meeting space rental company named ‘TOZ’ (http://www.toz.co.kr/index.asp)which has been in this industry for about ten years. In 2010, 3 million people used TOZ and the number of users is growing by 30%. I tried to find any article or webpage in English, but unfortunately, I couldn’t find any one. The following video clip will give you a glance of how the business model works even though it has a lot of Korean subtitles. The company defines ‘space’ by rentable rooms and ‘time’ by hours. If a room type is small to mid size, the rental fees are charged by person hour. If a room falls into a large category, the rental fees are fixed for two hours. But basically, the fixed fees are deriving from the occupancy. The meeting space is divided by the number of people the room can accommodate. The smallest room can only accommdate one person whereas the largest one can accommodate up to 60 people. The size of rooms are not explicitly shown, so the space is implicitly defined. However, since the number of people each room can accommodate heavily depends on the size of the room, the configuration of space should be planned ahead in the development period. Considering the redesign of floor plan is costly, the initial assessment of demand will hugely impact the utilization of space. TOZ rent out laptops and projectors to meeting organizers. They charge $1.5/hr for a laptop and $2.5/hr for a projector. Customers can have free drinks for sodas and teas, but they have to pay for snacks and fruit juices. TOZ also charges for Copy machine and Fax machine. TOZ created a online community for people who want to share information about certain topics such as arts, books, computers, games, and cookings. When there is a enough demand to have a offline meetings, they organize meetings making them rent their meeting rooms. With organizing offline meeting from online demands, TOZ has been able to generate more revenue. Sometimes TOZ maximizes the utilization of space with table mix. 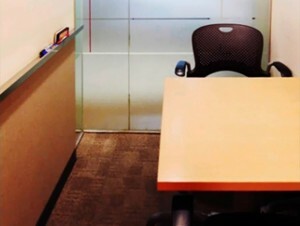 Some rooms are designed like a interview room. And some rooms are designed for students who want to study alone. More flexible configuration – If TOZ can use sound-proof sliding wall and move walls between rooms to accommodate as many as they can at a certain time, they can generate more revenue. For example, TOZ could have more larger rooms in the morning for office workers, and have more smaller rooms after dinner for group study rooms. TOZ has explicit pricing for the hourly rate. Basically TOZ is charging flat rate for hour or 30 minutes. For example, on a weekday, the price for each person is $5 for the first two hours, and $1.25 for extra 30 minutes. Basically, TOZ charges flat rate of $1.25 per 30 minutes per person for weekdays and $1 per 30 minutes per person for weekends and students. There should be more sophisticated pricing structure depending on arrival. Since the reservation works in ‘First come, fist served’ way, there is not much room for Revenue Management. But if the company charges different rates for different time of the day, they can capture more surplus from people with high willingness to pay. For example, if 7-9pm is the most crowded time of the day, TOZ should charge more for the period to generate more revenues as well as move price sensitive customers to less crowded time. There are two kinds of pricing structures: variable pricing and fixed pricing. In small room categories, TOZ charges $1 to $1.25 per 30 minutes per person whereas in the large room categoreis, it charges fixed rate per 2hrs per room. However, per person rate for large room categories($2.083/hr) is almost the same as the one with small room category if the room is fully occupied. Charging higher rates walk-in customers – From the revenue management’s point of view, forecasting demand plays an important role, and reservations is the most efficient tool for minimizing uncertainties. TOZ should encourage members to make reservations in advance. And walk-in customers are people willing to pay more than regular prices. Instead of giving away inventories for the same rate, TOZ should charge more for walk-in groups. Meeting over breakfast/lunch packages – Nowadays busy office workers are reluctant to allow separate time for meetings since it is a big commitment for busy people. So, providing a cozy meeting spaces with simple food (Toast, Cereal, Sandwiches) in lunch or dinner time will bring office workers who want to save their time during office hours. Not only the company can utilize the idle time, but they can also generate F&B revenue without any incremental facilities. EventBH if offering a compact lead retrieval tool to exhibitors, which captures leads in a large amount and is able to retrieve it anytime when needed. The lead retrieval app is compatible with all apple and android phones. EventBH event management app is one of the best Event Management software features solutions available in the market. It is a great event organizational and communication tool.